The Areca Palm, or Dypsis lutescens (formerly Chrysalidocarpus lutescens), is a great palm for a tropical splash in the summertime on home patios and building entrances in northern climates. It can also thrive indoors, but it takes a lot of light for that to happen, and it’s highly rated for cleaning indoor air. Also known as the Butterfly Palm, because of its arching yellowish-green fronds, and the Party Palm, because it’s widely rented for weddings and parties, this less-expensive cousin of the Kentia Palm is a great choice for a long-term relationship if you can give it great light and keep it warm; otherwise, it’s a cheap date you can flirt with all summer and try another one next year. Available in 2 sizes, coming in at about 3′ in the 10″ pot and 5′ in the 14″ growpot. Check out this video to learn more about the Areca Palm from our plant specialists. Read below for more information on caring for your new plant. With the high-light requirement, this palm is a heavy drinker. Thoroughly wet the soil with each watering and let it dry down until the soil surface is dry before watering again. Sub-irrigation can be very helpful in reducing the frequency of watering. Please see our watering guide for more details. Don’t let anyone tell you differently, the Areca Palm needs lots of light. You might be able to move it to low/medium light for special occasions, but if you want it to last you’ll need to have it parked in a very bright spot nearly fulltime. Like other plants shipped fresh from Florida, you won’t need to feed this palm for at least 6 months after you get it. That’s because there is residual nutrients in the soil from when the palm was being propagated. After 6 months, it can be fed quarterly with a complete fertilizer formulated for interior plants. But don’t let the yellow stems and petioles fool you in to thinking it needs more nutrients because the yellow color is a natural characteristic of the plant. This plant, with its numerous stems and plentiful leaves and leaflets can be a challenge to clean. While we still prefer a cleaning regimen with damp cloth soaked in water and a light soap solution, it would be okay to break out the feather duster on this plant. Make sure your feather duster is clean though because it’s a great way to inadvertently spread spider mites and other critters. Older leaves will turn brown (especially if you let it dry out) and you can just prune them off at the base of the stem. Eventually, too, the sheaths around the stem will brown and once they’re brown, you should be able to just peel them off the stem and expose the fresh, powder-coated stem beneath. There’s always a chance for a mealybug to set up camp on your Areca Palm. Look for the little white cottony mealybugs at the base of the leaves, on the stems, and especially under the leaf sheaths between the sheath and the stem; mites will hide on the bottom side of the leaves and produce webs. Be extra vigilant when scouting for mites, as they can do irreparable harm quickly often mistaken for dust on the underside of the leaves. If you see either of these, break out the spray bottle with a light soap solution and spray them daily ’til they’re gone. 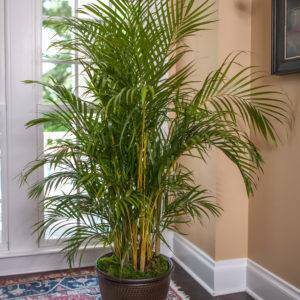 Keep an eye out for the bugs mentioned above, and you’ll enjoy this palm for a summer fling or long-term relationship in a well-lit room. The plant is beautiful! I could not find a palm this tall in any of the local nurseries and was thrilled when I found this option online. They did a great job shipping it and it arrived in perfect condition. I will be ordering more from them in the future! This plant arrived in perfect condition. Every leaf is bright green and beautiful. Customer service is great. Sue checks on the condition of the plant and spent a great deal of time helping me decide the best location for my plant. Last year I purchased a lisa palm and a white bird of paradise. Both are healthy and are nearing 9 ft. tall. My only issue is the cost of shipping. Sure you can! The areca palms will do well outside and you can just slowly move them in the direction where you want them. If you currently have them inside, move them to a shaded area outside for a week or so and then put them where you want them. Make sure you water them! They will definitely need more water outside. They will get a few yellow fronds that you’ll need to trim off as you notice them and will start to produce new growth that will acclimate themselves to your climate. In addition, you can give them more nutrients when they’re outside too. Osmocote and milorganite work well and both can be purchased as time-release fertilizers. Plant was beautiful in great condition. Shipping was a problem . I was told 3 days to arrive in Florida, it never got delivered. 2 weeks later I sent several emails and it was discovered that the plant was never shipped. Once I was able to get someone’s attention the plant was shipped and it did arrive 3 days later to my friends in Florida. We’re very sorry for the misunderstanding. It actually took 9 days for them to receive the shipment and did only take 3 days once it had shipped. We should have let you know that there is prep time involved and we also should’ve clarified that it was 3 days max to ship it but several days to prepare it for shipping! I’m glad it arrived safely and we’ll be sure to let future customers know that there is some time before shipping to get the plants ready for travel. Thank you for the order and for letting us know we need to clarify! great personal customer service and perfect plant! I loved it, minus the peculiar instructions. They were confusing, words were missing, and it all seemed like a lot of fuss for nothing. I chose to plant my plants in the traditional fashion and did not want wet fabric sitting under the roots.